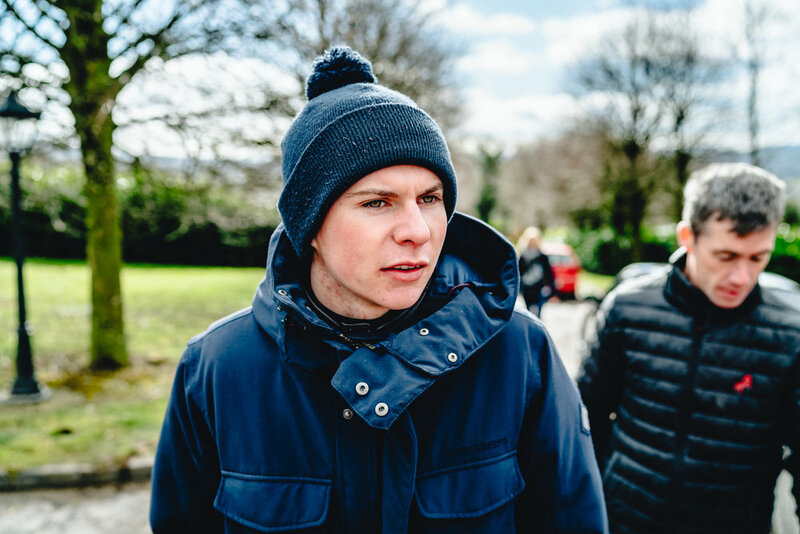 In February 2018 I was asked by the European Trainer Magazine to photograph an interview with Joseph O'Brien; the record breaking jockey-turned-trainer. The setting would be Joseph's stables near Piltown, County Kilkenny, on the 8th of March. The interview had been arranged ahead of the Cheltenham Festival and would be conducted by Alex Cairns from The Winning Post (you can check out his website here). I had been approached by the magazine for my lack of equestrian experience. The editors wanted a different approach to the status quo equestrian photographs, I gladly accepted the challenge. This was now my highest profile contract to date and I was anxious to do a good job. I cleared my schedule, packed my bags, booked a hotel, and pointed the car south. This post is not an in-depth report on Joseph and his operation, rather, it is a summary of my experience on the day as a photographer and someone with no prior equestrian knowledge. If my words fail, hopefully my photos will inspire. With the contract agreed I packed my two Sony A9 bodies and the FE 35/1.4 and GM 85/1.4 lenses. For those non-photographers, these two prime (non-zoom) lenses would give me the separation I needed to create a variety of compositions. The Sony A9 would provide the focus tracking and speed I needed to capture fast-paced action during gallops. The camera also offers full silent shooting at 20 frames per second (fps), meaning I could capture more action without distracting the horses and jockeys with the click-clack of a mechanical shutter. To carry both cameras I opted for a Peak Design system: 2 x capture clips and 2 x pro pads secured to my belt. This would be my first time trialling the system, with the intent of using it for future events and weddings. Many photographers choose the Money Maker strap for dual systems but uncontrollably swinging camera bodies around my waist makes me nervous and I didn't want the distraction of babying my gear on the job. Keep your eyes peeled for a review of the Peak Design system in a future post. 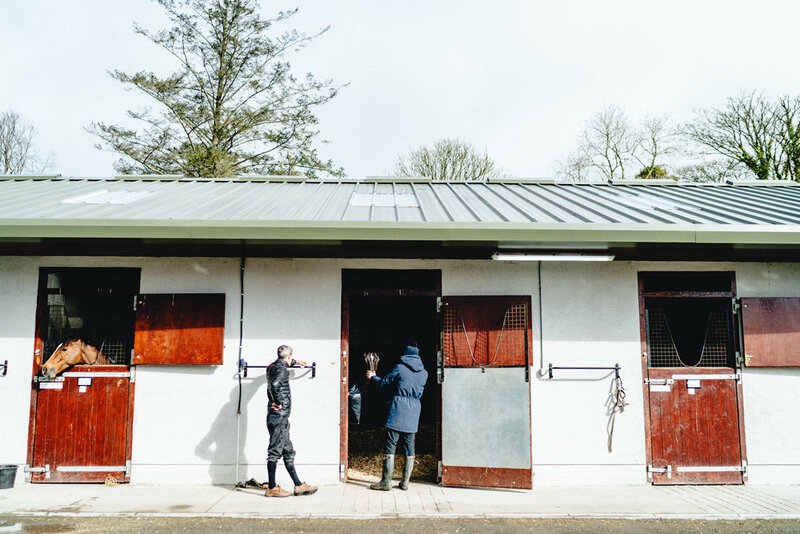 Carriganog Racing (Joseph's stables) are set high on Oakhill, County Kilkenny. The elevation affords visitors and workers (and horses!) stunning views of green Irish fields over rolling hills. As a bonus, thanks to unseasonably heavy snow the week before my arrival, there were snow covered mountains in the far distance. As a photographer I couldn't ask for a better backdrop! I'm not a horse racing expert but I could still appreciate Joseph's setup on Oakhill. 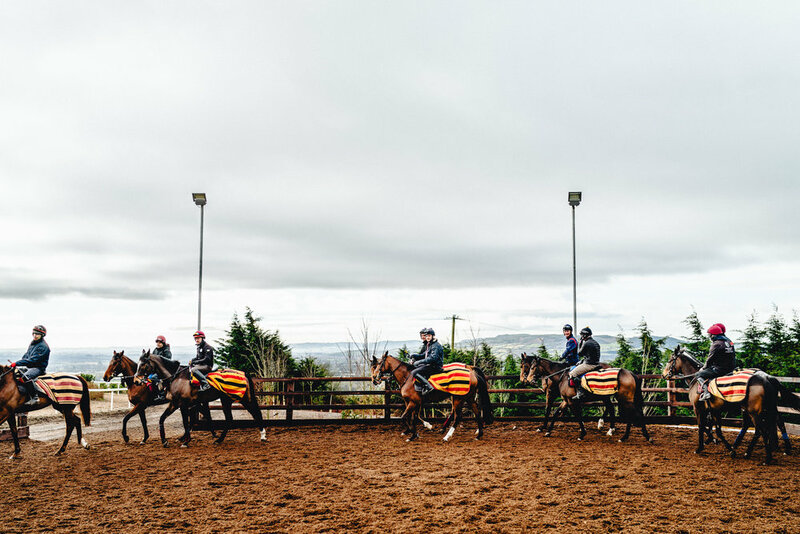 The facility is home to over 100 horses, with several gallops 1 at differet locations around the site. 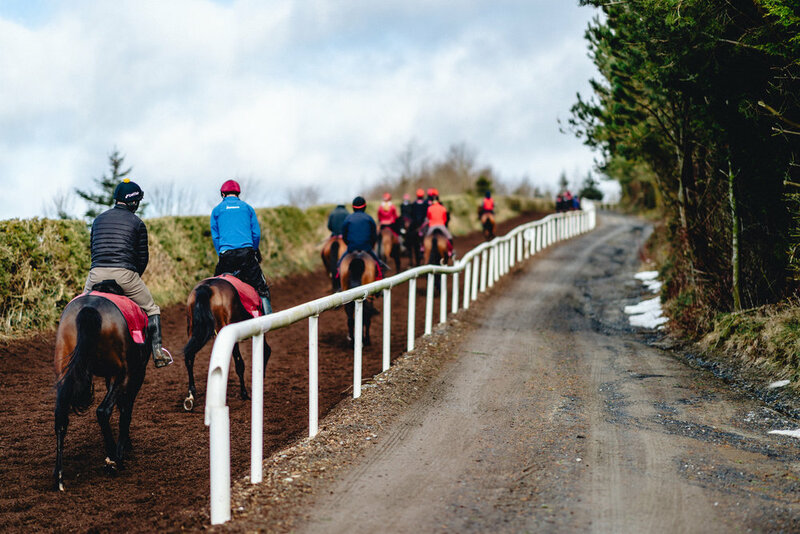 I'm not sure how many are employed at the stables but suffice to say there were many working the area, not to mention the dozens of jockeys taking the lots2 out. At only 24 years old, Joseph was firmly at the helm of this empire. It was around 9:30 am on the 8th and we had been blessed with a wonderfully crisp Irish morning. I took some time to stand and admire the views from the front of the stables. The peaceful silence was soon broken by the crunch of tyres on gravel and the soft gruff of a Land Rover engine, signalling the arrival of Joseph. The car door swung opened and Joseph stepped out to greet us. I felt my heart flutter - it was on. Joseph was dressed in navy and prepared for the cold, wearing an all-weather jacket, warm trousers, woolly hat, and a pair of welly boots that had seen a few miles in the mud. I felt warm looking at him. He calmly strolled towards us and, with a smile, offered his right hand in greeting before, in his characteristically soft tone, inviting us inside for a warm cup of tea. What a gentleman, I thought. My first impression: Joseph O'Brien had gravitas beyond his years, distilled from his quiet confidence, global reputation, and (as would become evident later in the morning), his astute knowledge of his industry. His manner was calm and reserved, one could almost say timid. But he knew his audience and was in complete control. We crossed the threshold into the stable's main building. Taking a left we entered a homely kitchen/living room, Joseph walked over to the kettle and started preparing hot drinks. I kindly declined one - I needed both hands for my cameras after all - but Joseph, Alex and my wife (yes, my wife made the trip to Kilkenny to meet him!) each had a cup. Drinks in hand, Joseph and Alex scraped their kitchen chairs across the wooden floor and took a seat; it was down to business. The smell of fresh tea and coffee tumbled through the air - pesky cameras! What proceeded was around 45 mins of interview. I had my cameras poised throughout and used a combination of the 35mm and 85mm lenses to add as much variety to my shots as possible. I set the cameras to silent shutter mode throughout the interview, I didn't want to cause unnecessary distraction. Silent shooting is a strong attribute of the Sony A9 which can't be praised enough, especially in intimate scenarios like this. As I moved around the room I thought about how the editors might build the article. I experimented with compositions I thought would engage the readers and tell the story of what was in front of me. After tea it was time for Joseph to head outside and check the morning lots. We took our seats in his 4x4 and left for the gallops. It was a bumpy ride and we joked about how quickly Joseph was navigating the grounds, he clearly does this every day! 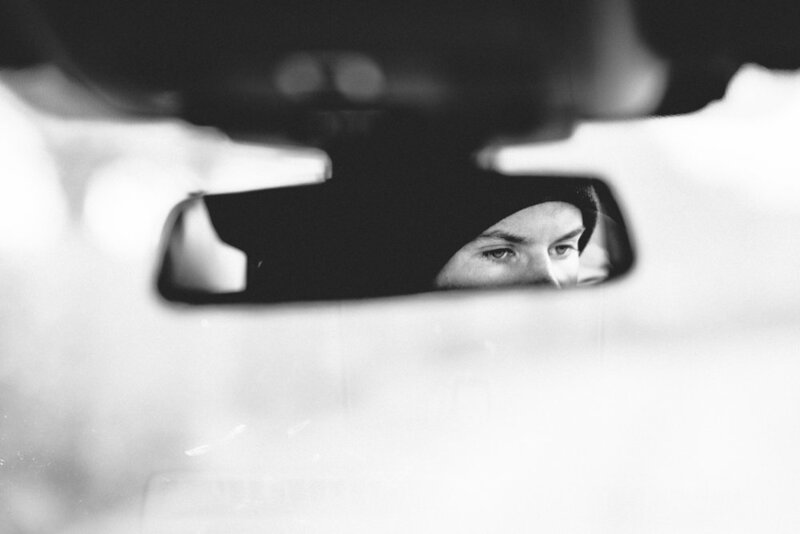 After a few moments of driving the car grew silent and it was at this point that I noticed Joseph's eyes in the rear view mirror. They were fixed to the road and I could sense he was deep in thought, likely about his day's activities and the preparations for Cheltenham. This is a daily drive for Joseph and I'm sure he appreciates the time alone to reflect and plan. This is a part of his story I needed to capture. The road was still very bumpy and trying to get the shot was going to be challenging. This is where the monsterous Sony A9 stepped in. I opened the aperture to create maximum separation between Joseph's eyes and the scene, set the camera to continuous autofocus, and turned the shutter dial to the fastest burst mode (20 fps). I depressed the shutter button for a couple of seconds as the camera silently rattled off shots. Some may call this approach cheating but I say it's using my tools to full effect under the conditions. I reviewed the images and the winning shot was there3. Shortly afterwards we slowed to a stop beside a fenced paddock, inside which a lot was warming up ahead of their gallop. We stepped out of the car and into the centre of fencing. It was an amazing feeling to be in amongst the circling procession of jockeys and horses. Even in a slow paced trot the sound and sense of potential energy was palpable. Joseph spent a few minutes there calling out to each jockey by name and asking for a quick report on the condition of their horse. Each time was a brief interaction, lasting mere seconds, but both parties knew the score and Joseph got the info he required. Standing in the pen I noticed two flood lights in front of me, below which ran a fence that guided your eyes from right to left as the horses circled. The lines of the fence were complemented by the horses' covers, which had stripes running parallel. This would make a great shot for the article so I released the A9 from its home on my right hip, set the aperture to f4 and waited for some symmetry in the horse procession before hitting the shutter button. My first equestrian photograph was taken. I spent the remaining time in the paddock capturing little moments as they happened. One of Joseph's unique training tools is an (approximately) 340 foot uphill gallop close to the paddock where the horses were warming up. It is now my understanding that this steady climb builds endurance into the runners. We spent most of the morning on the road parallel to this gallop, watching the lots make their way up and down at various locations. It was amazing to hear the horses thundering past. I began to understand how this sport can be so addictive. Joseph's inspecting eye was constantly scanning the horses as they galloped past, only taking time to answer questions from Alex when they had reached the top of the hill. On their return down the hill, as he had done previously in the paddock, Joseph spoke to each jockey by name, relaying instruction or getting feedback ahead of the next gallop. I have to point out that during both the paddock and gallop sessions each jockey's eyes were constantly searching for Joseph's. When their eyes met, either instructions or an assessment of a horse's performance were briefly but precisely exchanged. I recall the gravitas I mentioned before, it is clear Joseph commands respect from every jockey at his stables. It was approaching noon when we returned to the stables. Here Joseph and the rest of us took time out to chat, feed the horses and unwind; although Joseph's phone didn't let him completely switch off. We had the chance to meet the miracle horse 'Edwulf'. A stunning and gentle animal. This was the perfect environment to capture a few frames of the unseen Joseph, sheltered from media attention and surrounded by his true passion and love - horses. As I shot my final photographs I did so with a smile. Through my lens was a young man who has already achieved so much but still had the world at his feet. Yet, with all of his success, he remained humble, making him approachable and dare I say it 'normal'. His passion and calm persona was contagious and I ended the day feeling invigorated to treat my own work with the same degree of professionalism and humanity. I am glad I got the opportunity to take on this contract. I'm often asked how I edit my photographs. My style is constantly evolving but this year I have been enjoying the colours and tones in VSCO's "Modern Film Pack 01". My workflow is to apply my chosen preset on import to Lightroom before tailoring the look to my taste, which normally involves a lot of tweaks! Remember: like all presets, VSCO's packs are not a one-click solution and require some careful thought about the final look you want to achieve! For all interested, you can find the full article of the Joseph O'Brien interview here. It is much more suitable for those with a strong equestrian and racing background. 1 Gallop is an equestrain term, in this case referring to a long stretch where horses can reach their full speed natural gait. 2 A lot is a group of horses and jockeys (around 20 - 30). 3 This shot was used as the cover shot for the article.